I’m delighted to report that “The 8 Essential Skills for Supervisors & Managers” has been adopted by a major international law firm. The well-respected firm has purchased nearly 500 copies for distribution to their managers around the world. More to come as this develops, but I love it so far! Interested in seeing your supervisors and managers get better results for you and your organization? Buy them all a copy of The 8 Essential Skills. Contact us today! As you can plainly see, this is my first post in quite awhile to this blog. 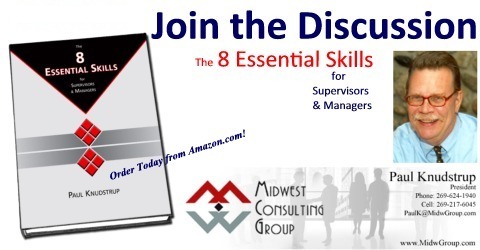 In the past the blog’s focus was directly linked to the content of my 2010 book, “The 8 Essential Skills for Supervisors & Managers.” Now that the book is getting wider recognition it’s time to reactivate the blog and provide a broader focus. We’ll see where this goes and who decides to join the ride. I’m always on the lookout for what I call “neat to hang out with” people. Maybe you? For those in the Central Pennsylvania area, the Centre Daily Times on Sunday August 15th contained a nice feature on The 8 Essential Skills. Thanks to long-time client and friend Edie Trent of Hilex Poly’s Milesburg PA location, the book got a great plug this past Sunday. The State College area SHRM Chapter of HR professionals regularly provides information of interest to job seekers, managers, and other human resource departments. Below is a quick view of the feature; thanks Edie! We all have our individual “hardwiring” – those aspects of who we are that are the product of our genetic makeup and early nurturing. In some ways we are driven to behave, react, communicate, and think as we do. Often subconsciously, and sometimes in spite of our conscious desire otherwise. Over the years some particularly valuable and practical tools have helped us better understand ourselves. As a result, we come to understand other people better. Personality – our preferences – those in-born ways of looking at the world, what energizes us, how we make decision, and what we pay attention to. We use the Myers-Briggs Type Indicator (MBTI) to help understand Personality. Hemisphere – while we use both right and left hemispheres of our brain all the time, but most of us utilize one hemisphere more than the other. Whether we are Left Brain or Right Brain dominant has a major affect on how we learn new information and skills. Information Processing – our three major senses (Visual, Auditory, Kinesthetic) provide us with most of the information we use in life. Information we acquire through our dominent sense seems clearer and is more easily absorbed. Talents & Strengths – our innate individual “gifts” – those aspects of who we are when we’re at our best. We use the Clifton StrengthFinder assessment to help people understand their talents and those of others. Understanding yourself is an essential part of Skill 1 – Managing Yourself. What’s your hardwiring like?